Swerve Rack on a Rail is contemporary combination that provides security, flexibility and convenience. The popular Swerve Rack made from 1.9"O.D. schedule 40 steel tubing with an innovative angular configuration that facilitates as a lean bar that offers 2 points of support to ensure bikes remain upright and parked properly. Securing the Swerve Racks on the thick 3/16" galvanized side rails, allows for more flexibility than other mounting options. 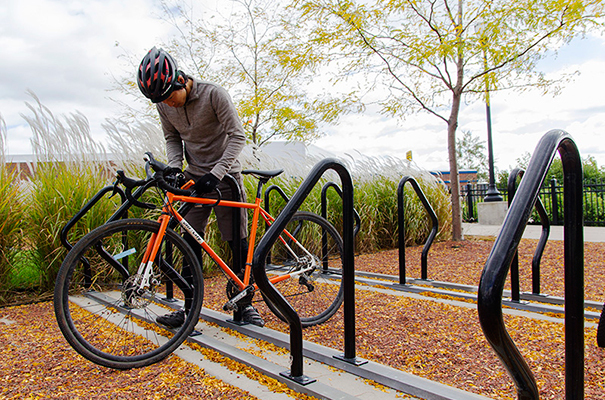 Anchored or freestanding rail mounted bike racks provide an economical solution and makes expanding bike parking a cinch.